Bio: I grew up in Eden Prairie, MN. My parents gardened in community gardens for a while, then put their own plot in our backyard. I wasn’t too interested in gardening until after college. 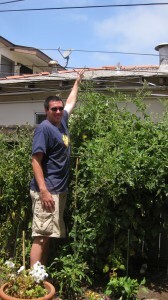 I was living with Corey and Brian and we tried to grow a few tomatoes and peppers in a small plot next to our patio. There wasn’t enough sun getting to the plants, but we ended up harvesting a bunch of serrano peppers. When I moved to San Diego a couple years later, I became more interested in gardening. I have gardened each year I have lived here and things have gone better each time. Nice sight man!!! I’ve got the flowers going and need to expand that garden. I like the tomato tip and will start competing with my neighbor.